A central focus of the ministries of South Side Christian Church is our worship of God in Jesus Christ. Because we believe that people of all ages bring gifts to the worship setting for other generations to be blessed by, we believe that worship of God needs to be for a multi-generational family by a multi-generational family. We also support multi-sensory worship through sight, sound, taste and smell. We have celebrated many baptisms and new lives of faith by immersion. We have welcomed new family members into our fold as well as said, "welcome back" to long time members too. Music is an integral part of worship and we have been and are blessed by the musical talents of so many. We are blessed through worship experiences such as special Lent and Easter worship, Easter Sunrise Service, global worship with our Congo Partners, World Communion Sunday, Thanksgiving, Advent and Christmas worship (including a Blue Christmas service), Epiphany, Day Camp Celebration Sunday, Pentecost, Recognition of our graduates, dedication of infants, and heartwarming testimonies about the annual mission trip. In all things, we come together as the Body of Christ to offer our praise and worship for God's abundant love. Outreach and missions are a primary focus of nearly every ministry of SSCC. The Outreach team sponsors many activities in sharing the love of God outside our church walls throughout the year. From special worship opportunities to youth and small group activities, all of who we are as a congregation is to share the love of God with ALL people. In the past, church members have participated in a mission trip to Nashville, TN in 2011, Joplin, MO in 2012, and an Alternative Spring Break to Henryville, IN in April of 2013 and we traveled to Rockaway Beaches, NY in 2013 assisting in Superstorm Sandy recovery. In 2015, we traveled to McDowell County, WV to serve one of the poorest counties in our nation. June of 2016, we returned to North Fork, WV for continued work and in 2017 traveled to to Big Creek Missions in KY to minister to families in southeastern Kentucky. Beginning in the Fall of 2013 and finishing in the spring of 2015, SSCC partnered with First Christian Church of Kokomo for a Disciples Build for Habitat for Humanity! Our church supports a Giving Tree from November to February. The tree bears gifts of coats, gloves, scarves, hats and Care Cans. These gifts are given no questions asked. By the end of December 2016, our first year, over 170 coats, 70 cans, 75 hats, 75 scarves, 50 socks, 35 pairs of gloves, 40 throw blankets, and 60 sweatshirts! In April of 2018, we opened our outdoor Little Pantry. This pantry is filled daily with staples and toiletries. With the closing of the local food pantry it has proved to be a valuable resource to those who just need a little extra to get them through the month. We also maintain a Little Library for our neighborhood friends. Other local outreach projects include Serve Together Kokomo, the Heifer Walk, Walk A Mile In My Shoes (Rescue Mission/Open Arms), and educating the congregation on the many ways they can change the world and share the love of God! Donations for the Little Pantry and The Giving Tree are greatly appreciated. The youth of South Side have and are participating in the Adopt-a-Grandparent program through Samaritan Caregivers, Walk-a-Mile In My Shoes, and Christmas caroling to our homebound members. They work in the Prayer Garden, assist in summer Day Camp, and serve as acolytes and scripture readers. All of the youth have planned and presented Youth Sunday and occasional other services. Fun activities include Day Camp, overnight retreats, fishing, corn mazes, Indiana Beach, trips to Chicago, swimming, horseback riding, Chi Rho Jam and CYF Assembly, Church Camp (http://camp.indianadisciples.org), A Night In Bethlehem (A hands on Christmas event), and many other activities. Our youth are active! We are never too old or too young to learn about God! The Christian Education team develops and educates children and adults through Bible Study, Sunday School classes, and youth groups. Currently, we are using the "Whole People of God" curriculum, a lectionary-based study, for Sunday School, youth group and our mid-week Bible Study. The team provides volunteer teachers as well. Special themed studies are offered such as World Religions, Spiritual Disciplines, "Living the Questions", the Daniel Plan and Lenten studies. Christian Education offers an annual Day Camp for kids age 3 to those finishing the 6th grade. They also sponsor events such as Night In Bethlehem, the Faith & Film Small Group. South Side women also enjoy Women's Retreats both at the church and at other venues (like Brown County and Lake Michigan!). SSCC believes that Christian Education and training is from the cradle through the Golden Years. Come grow with us! The Crusaders Sunday School Class has been meeting longer than anyone can remember! Beginning each class with hymns and prayer, this faithful group of seniors is dedicated to the study of God's Word. Currently, the Crusaders are using the curriculum, "The Standard Lesson Quarterly" to learn and grow in the Scriptures. Children's Worship offers an exciting way to approach faith formation with children. The approach recognizes children as spiritual beings who already have a relationship with God. Through Children Worship, children learn about God as they experience God. They hear Bible stories in a way that allows them to enter into the stories that follow what is being heard in the worship service. Children Worship is for children beginning at the age of 3. This programmeets during the worship hour after the Children's Moment. Prayers, Bible Stories and preparation for worship are key components of this experience. Nursery services are available during both Sunday School and Worship. There is weekly a Bible Studies on Wednesdays at 10:00 A.M. Join us to explore how the Bible is a living book that speaks to us differently each time we read it. God's Word reaches us just where we are and tells us just what we need to hear when we need to hear it so we can grow all the time. CWF is open to all women of the church. Meetings, called "circles" are held monthly and there is a lesson and mission study at each gathering. CWF sets aside a budgeted amount and other income each year for missions. Monthly service projects help collect needed items for different organizations in town: Kokomo Urban Outreach, Rescue Mission, CAM, Open Arms, etc. Our main fundraisers are 2 Rummage Sales a year (spring and fall) - diving the income by giving 10% to Disciples Mission Fund, 20% to property advancements like carpet in the sanctuary, and 70% for local projects. This women's group also sponsors community-wide events like Easter Breakfast and Trunk-n-Treat at Halloween. South Side Christian Church has a beautiful Prayer Garden on the grounds of the church property. It is a scenic and restful place for prayer, meditation and outdoor worship. There are meditation points throughout the garden designed to guide you as you pray and meditate. Women's retreats have been held at both off-site locations as well as right at the church. This ministry seeks to offer women a much needed time away to reflect and grow in the Spirit. Of course, fellowship with fellow sisters in Christ is a highlight as well! Please watch the events page for more information on planned retreats. 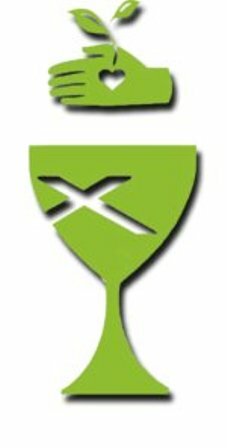 SSCC is a Green Chalice Congregation with the Christian Church (Disciples of Christ) and Disciples Home Missions. We covenant to live both as a church and as individuals of faith to care for and protect God's Creation. The Green Church small group meets in order to bring new ideas for greening the church and educating the congregation on ways to be greener at home too! We will share these concerns with others and urge them to make this covenant. The Wrapped In Prayer small group is a pastoral ministry of SSCC that seeks to bring healing and wholeness to those who are struggling with health and/or grief issues by creating Prayer Shawls to be given to people facing difficult times in their lives. Meeting 2 Tuesdays a month, the knitters and crocheters of the church gather in the parlor to work together, fellowship together, and to pray together. Prayers are offered for both the shawls, the recipients of the shawls, as well as the hands and the hearts that have created them. With each stitch, may wholeness, healing and peace be granted.